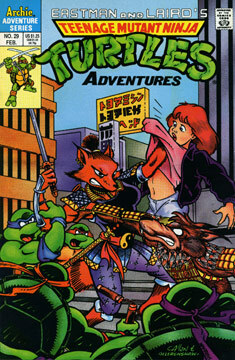 The issue begins with Master Splinter recounting his first hand experience witnessing the atomic bomb being dropped on Hiroshima back in 1945 (Note: TMNT Adventures utilizes the same origin for Splinter that was used in the cartoon, in that he was once a man named Hamato Yoshi as opposed to being the pet rat of Yoshi, as he was in the original comic book from Mirage). Our heroes have arrived at the Industrial Exhibition Hall, one of the few structures that withstood the force of the blast. It has been left in its decimated state to remind everyone of the horrors of war. Splinter reveals that this is the first time that he has seen the building since that fateful day in 1945. The Sensei is interrupted as Ninjara arrives on the scene and a battle erupts between the TMNT and her sorcerous white ninja forces. Back at the docks, Fu Sheng agrees to help Chien Khan if he promises not to harm the girl. The Khan agrees and then states that it has taken Ninjara many years to steal all of the artificats required to perform the ritual. The Turtles continue to battle Ninjara as Fu Sheng prepares the transformation powder for Khan. The Warrior Dragon is released and is now under the control of Chien Khan, who sends him on a mission. The TMNT are fairing well in the battle when the Warrior Dragon arrives on the scene. The Turtles notice that something is wrong with their friednd, so they hop on board to see what he’s up to. Ninjara also manages to climb onto the Dragon, as she threatens to cut out Raph’s heart. At the warehouse, Fu Sheng admonishes and uncaring Chien Khan for ordering the Dragon to destroy a nearby nuclear power plant and use its power to open a gateway to a world of demons.